The aims of this longitudinal study were to investigate a significant threshold shift (STS) among personnel working on board the Royal Norwegian Navy's (RNoN) vessels between 2012 and 2014 and to identify possible determinants of STS. Hearing thresholds were measured by pure tone audiometry in two consecutive examinations (n = 226). STS was defined as an average change in hearing thresholds ≥ + 10 dB at 2,000 Hz, 3,000 Hz, and 4,000 Hz in either ear. Determinants of STS were assessed through a questionnaire. The incidence of STS was 23.0%. Significant determinants of STS were the number of episodes of temporary threshold shifts (TTS) in the Navy, exposure to continuous loud noise during work on board, and the number of gun shots (in the Navy, hunting, and sports). This study indicated a significant association between noise exposure on board Navy vessels and development of STS. Noise levels measured in different locations on board the Royal Norwegian Navy's (RNoN) vessels have been found to exceed the recommended maximum noise levels in most vessel classes. Work on board Navy vessels is associated with exposures to continuous noise from the vessel machinery and to impulse noise from shooting and explosions. Although impulse noise exposure has been shown to be more harmful to hearing than continuous noise,  there is limited knowledge concerning the effect of long periods of continuous noise without the possibility to recover. The aims of this longitudinal study among personnel on board RNoN vessels were to investigate the incidence of significant threshold shift (STS) between 2012 and 2014 and to identify the determinants of STS development. This longitudinal study is part of a project concerning noise exposure and health in the RNoN carried out by university researchers in collaboration with the RNoN. Data were collected in two time periods: from April 2012 to June 2013 (baseline) and from August 2013 to December 2014 (follow-up). The audiometry was performed by trained personnel at three naval bases, supervized by a university researcher. Two contact persons in the RNoN were provided with a complete sailing plan for the RNoN and lists of personnel on board. The contact persons were responsible for informing the management on board each vessel about the objectives of the project before commencing the examinations. Next, the management was asked to communicate this information to the Navy personnel on board each vessel in plenary. Information was also put up as posters on most vessels. Sailing officers, enlisted and civilians were scheduled to meet for audiometry when they arrived at the naval bases. No conscripts were invited, as their limited time of service made follow-up difficult. When entering the audiometry examination facilities, the Navy personnel received a typed letter with information regarding the study, and those who wished to participate confirmed by signing an informed consent. Each participant was asked to fill out a questionnaire regarding the possible risk factors for hearing loss before completing the audiometric test. Our intention was to assess the one-year development of hearing loss among Navy personnel. However, due to inaccessibility of participants at the scheduled examination and reduced workforce among the trained hearing test personnel at the naval bases (sick leave and leave of absence), the mean number of days between the baseline and follow-up was 530, ranging 242-959 days. A questionnaire was prepared to identify the determinants of STS development between examinations. 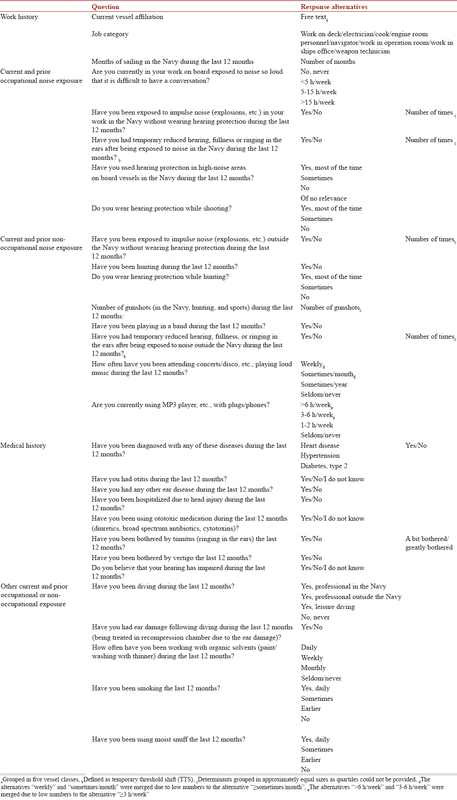 The questionnaire included questions about vessel affiliation, work history, past and present occupational noise exposures and non-occupational noise exposure, use of hearing protection devices (HPDs), general and ear-specific health, and other exposures that might affect hearing (e.g., diving and smoking) [Table 1]. The trained personnel ensured that the questionnaires were completed. In order to ensure proper data quality, a test protocol was developed. After every examination, a stepwise checklist was completed to make sure that the protocol had been followed. The presence of ear canal obstruction was assessed by otoscopy prior to audiometry and in cases of complete obstruction, the cerumen was removed and a new audiometric test was completed at least 1 week later. Exposure to loud area noise, loud workshop noise or other loud noise exposure in the previous 16 h was noted in the checklist. Temporary threshold shift (TTS) was suspected among participants with recent loud noise exposure and hearing thresholds ≥25 dB in either ear at 3,000 Hz, 4,000 Hz, or 6,000 Hz. These participants could only be included in the study if a new audiometry was conducted without prior exposure to loud noise. Audiometry was not performed if participants had acute airway infections involving sinuses, nose or ears, and a new appointment was made when these participants were asymptomatic. All audiometric tests were evaluated by the university researcher and an occupational health physician in collaboration with an otolaryngologist, and referrals were made when necessary. A total of 938 Navy personnel were scheduled to meet for the baseline examination [Figure 1]. However, 149 did not show up and 17 did not wish to participate in the study. Thus, data were collected from 772 participants giving a response rate at a baseline of 82%. Due to missing compliance with the protocol and technical failure of one of the audiometers, the number of participants included at the baseline was reduced to 605. Of the 605 participants included at the baseline, 291 completed the follow-up (response rate of 48%). Unfortunately, data from 65 participants in the follow-up were excluded as the examination was not performed in accordance with the protocol. Thus, the longitudinal study comprised data from 226 participants. Loss of follow-up (n = 314) was due to reassignment to work on shore (n = 63), termination of service (n = 129), or other reasons (n = 122) such as difficulties in synchronizing the hearing examinations with the prearranged sailing pattern as well as absence due to courses, time off, or leave of absence/sick leave. All participants agreed to join the study by signing an informed consent at baseline. Thus, we do not believe that loss of follow-up might be caused by refusal to participate. Paired sample t-test was used to determine whether the mean hearing threshold for each frequency differed significantly between the two audiometric tests for the left ear and right ear. This test was also used to assess whether the mean hearing threshold for each frequency at follow-up differed significantly from the median hearing thresholds as expected by ISO 7029:2000. Log binomial univariate regression analyses were performed to estimate associations between independent determinants from the follow-up questionnaire and STS. Log binomial multivariate regression analysis was then performed to assess the relationship between significant noise exposure determinants and STS. Continuous determinants from the questionnaire were initially categorized in quartiles. However, due to poor spread of data, we chose to distribute the exposed groups of the following determinants into approximately equal sizes: number of episodes of impulse noise both in and outside the Navy, number of gun shots (in the Navy, hunting, and sports) and number of TTS episodes in and outside the Navy. Results were presented as relative risks (RRs) with 95% confidence intervals (CIs). P values < 0.05 were considered to be significant. Difference in prevalence of hearing loss at baseline among the participants included in the study compared to participants who did not did not meet at follow-up was assessed using the chi-square test. In these analyses, hearing loss was defined as ≥25 dB at 3,000 Hz, 4,000 Hz or 6,000 Hz in either ear. The data were analyzed using IBM SPSS Statistics, version 22, (Armonk, NY, USA). The study was approved by the Regional Committee of Medical and Health Research Ethics (REC South East) and was performed in accordance with the 1964 Declaration of Helsinki and its later amendments. The participants were informed about the research project and gave written consent to take part in the study. Withdrawal from the study could be made at any point. There was no payment or other benefit for participation. Each individual audiometric test was evaluated. If any deviation from normality was discovered, the participants were informed and given advice for help in a personal letter. The data were otherwise registered with id numbers, not names, during the statistical analyses. The list of id numbers and names was locked safe by the researchers. The audiometry data were not accessible to anyone in the Navy except the trained personnel performing the audiometry. The trained personnel were not allowed to report the results to anyone except the researchers. Thus, it was emphasized that the audiometry results would not be used in evaluation of medical suitability for continued service. The RNoN funded the study but a contract between the RNoN and the university stated that the university had the right to publish all results at the group level. Among the 226 participants, 217 were males and nine were females. The mean age was 33 years, ranging 20-53 years. On an average, the participants had sailed for five of the last 12 months. The incidence of STS among the Navy personnel during the study period (April 2012 to December 2014) was 23.0%. For the left ear, significantly higher mean hearing thresholds (i.e., impaired hearing) were found at frequencies 250-6000 Hz, and significantly lower at 8000 Hz at follow-up compared to baseline [Figure 2]. For the right ear, mean hearing thresholds were significantly higher at follow-up than at the baseline at the frequencies 1,000 Hz, 2,000 Hz, 3,000 Hz, and 4,000 Hz [Figure 2]. 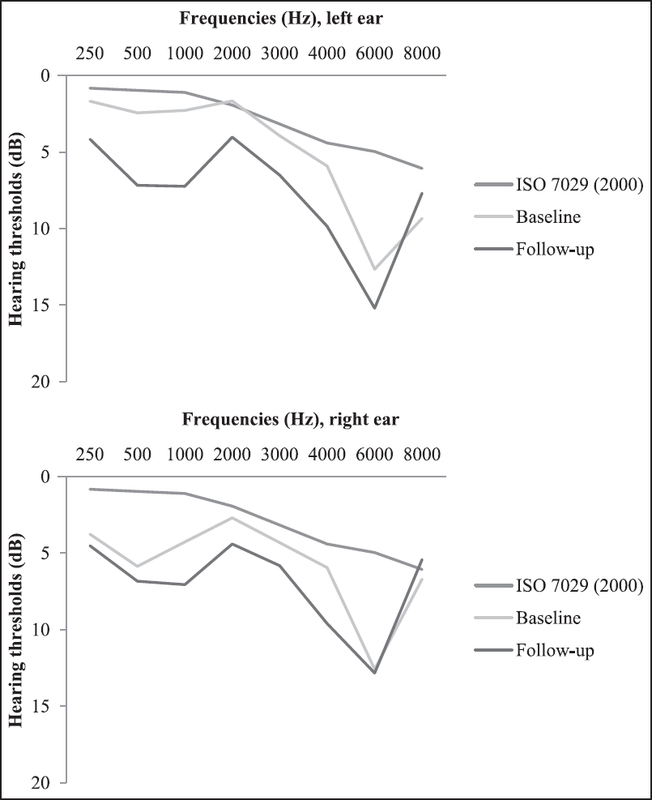 The mean hearing thresholds measured at follow-up were significantly higher than the International Organization for Standardization (ISO) standard at 250-6,000 Hz for both ears [Figure 2]. Participants who reported exposure to >5 episodes of TTS in the Navy during the last 12 months had a significantly higher risk of STS in the log binomial univariate analyses compared to Navy personnel without this exposure [Table 2]. Participants who were currently exposed to >15 h/week of loud noise during work on board (making it difficult to have a conversation) had a significantly higher risk of STS compared to Navy personnel without this exposure [Table 2]. A significantly higher risk of STS was also found among participants who had been shooting 1-200 gun shots (in the Navy, hunting, or sports) during the last 12 months compared to participants who had not been shooting at all [Table 2]. The estimates also increased for shooting >200 gun shots although these were not significant. In multivariate regression analyses, the two noise exposure determinants were both associated with a higher STS risk although estimates were slightly reduced (>15 h/week of loud noise: RR 1.83, CI 0.80-4.23 and 1-200 gunshots: RR 2.35, CI 0.95-5.81). TTS was not included in the log binomial multivariate regression analysis as TTS is caused by noise exposure and is not considered to be an individual determinant of impaired hearing. No significant association was found between STS and the following determinants from the questionnaire: age, gender, vessel class, job category, duration of sailing, impulse noise in or outside the Navy, use of HPDs, work with organic solvents, diving, heart disease, hypertension, diabetes, otitis or other ear disease, tinnitus, TTS outside the Navy, vertigo, admittance to hospital due to head injury, use of ototoxic medication, use of cigarettes or moist snuff, hunting, playing in a band or attending concerts/disco, use of MP3 player, and subjectively impaired hearing. No significant association was found between STS and number of days between baseline and follow-up. Analyses were made to assess the prevalence of hearing loss at baseline among the participants who completed both examinations, compared to the participants who only participated at baseline. The prevalence of hearing loss among the 226 included in the present study (35%) and the 314 who did not meet at follow-up (27.8%) was not significantly different (P = 0.08). After an observation period ranging from 8 months to 2.5 years, 23% of the Navy personnel developed STS and the mean hearing thresholds had deteriorated significantly between the two audiometric tests for the majority of frequencies. The mean hearing thresholds were significantly higher than expected by ISO 7029:2000 at all frequencies but 8,000 Hz. Univariate analyses indicated a significant association between the number of episodes of TTS in the Navy and STS development. Participants who were currently exposed to >15 h/week of loud noise (making it difficult to have a conversation) during work on board Navy vessels had a significantly higher risk of STS compared to participants without this exposure and participants who had been shooting 1-200 gunshots (in the Navy, hunting, and sports) the last 12 months had a higher risk of STS than participants who had not been shooting. The multivariate regression analyses showed an increased risk of STS for both these two noise exposure determinants, however with slightly decreased estimates when compared to the univariate model. A clear interpretation of whether the continuous noise or impulse noise was most important for developing STS was difficult due to low numbers. Two previous US Navy studies have reported similar occurrences of STS as found in our study. , Investigation of 12,492 audiometric records from the personnel working on board vessels in the US Navy revealed an STS incidence of 29% between 1987 and 1990. Records collected between 1995 and 1999 showed an STS incidence of 18.1% among 54,057 US Navy personnel either working on board vessels or ashore. The different STS rates in the two studies might be explained by different noise exposures on board vessels and ashore, indicating a higher risk of hearing damage among personnel on board Navy vessels. This hypothesis is supported by our present findings, showing that personnel exposed to noise during their work on board had a significantly higher risk of STS. Our findings correspond with results from a previous investigation of audiometric records from almost 268,000 enlisted US Navy sailors from 1982 to 2004. This study showed that personnel working 1 year on board warships had a higher risk of STS (RR 1.06, CI 1.06-1.07) than personnel working 1 year on shore (RR 1.04, CI 1.03-1.04). In a recent cross-sectional study conducted in the RNoN, a significant association between hearing loss and years of sailing was found, indicating a 0.48-dB increase in hearing threshold level (poorer hearing) at 4,000 Hz per year of sailing. An association between the number of months of sailing and STS was not found in the current study probably due to the short observation period. As few Navy studies have reported on the incidence of STS; it is relevant to compare our findings with results from other military branches, which may have similar exposures such as the Army. Studies from the Swedish Army have demonstrated high levels of noise exposure, both to continuous noise from armored vehicles (103-107 dB(A)) and impulse noise from various firearms (156-184 dB SPL). , The development of deteriorated hearing thresholds among conscripts in the Swedish Army was evaluated in two studies showing STS incidences of 6.6%  and 7.9%. The STS incidences described in these studies were lower than the STS incidence found in our study. The higher STS incidence found in our study might be explained by continuous exposure to moderate noise levels for days and weeks on board RNoN vessels. However, the lower incidences described in the Swedish Army studies might also be explained by a shorter observation period (7-11 months), and thereby shorter exposure time, and a lower average age (18-19 years) with a lower risk of age-related hearing loss. Different STS incidences might also result from the use of different STS definitions. In the Swedish Army studies, STS was defined as a 15-dB decline in hearing thresholds in at least one ear, at one of the frequencies 250-8000 Hz  or 500-8000 Hz. Hence, when compared to our STS definition, a greater shift was needed to induce STS in the Swedish studies although more frequencies were included. The varying incidence of STS can also be explained by use of different audiometric test methods. We included registration of hearing thresholds below 0 dB while the Swedish studies limited registration to hearing thresholds of 10 dB or above. , Registration of hearing thresholds below 0 dB will detect deteriorated hearing thresholds at an earlier stage, thus increasing STS. Our questionnaire data indicated a higher risk of STS among participants with prior occurrence of TTS due to noise exposure in the Navy. Previous military studies have assessed the association between TTS and noise exposure in terms of aircraft noise exposure  and exposure during shooting. In these studies, only minor TTS was registered. However, our study indicates that TTS in the Navy is a potential threat for development of permanent threshold shifts (PTS). The longitudinal design of our study in combination with objective audiometry results and the utilization of detailed questionnaires on potential determinants made it possible to address cause-effect associations. Data from previous military studies are frequently acquired from frequently acquired from HCPs and and medical record databases with limited information on possible determinants of hearing impairment. When an STS is discovered, one would normally acquire a follow-up shortly after the last test to verify the hearing impairment. Unfortunately, we did not have resources to provide an additional audiometry soon after the measurements as the participants were sailing in many different locations, and the RNoN could not coordinate more examinations during the time ashore. However, as we used a strict protocol and a checklist to assure proper quality in audiometry measurements, we believe to have limited the introduction of false positive results. The use of this strict protocol for data collection and audiometry measurement is a strength of our study. The results from the audiometric tests were used to assess hearing capabilities among the RNoN personnel and not to assess individual medical skillfulness related to work on board Navy vessels. The participants were assured that their results would not be given to anyone except the researchers. The management on board the vessels scheduled appointments for all Navy personnel. They had no information regarding individual hearing abilities; hence, they could not influence the outcome. We were not able to include as many participants as intended at follow-up, primarily because a significant number of participants was reassigned or had their service terminated. 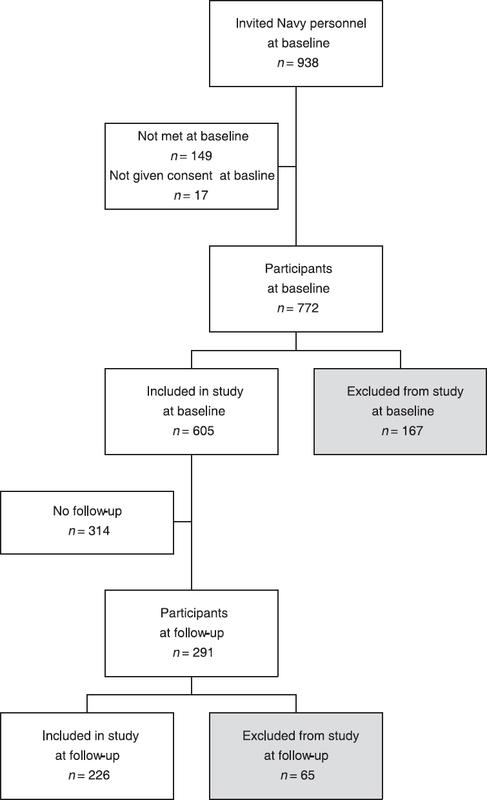 Although the prevalence of hearing loss at baseline was higher among the participants included in the study than among personnel who did not meet at follow-up, the difference was not significant. Hence, we do not believe that the loss of follow-up has influenced the results and consider the participants included to be representative of the Navy population. Still, a higher response rate would have been an advantage. Another limitation of this study was that we could not present individual objective noise exposure data. Ideally, detailed information regarding individual noise exposure on board and the time of sailing should be collected using individual log books. However, such quantitative exposure assessment was not feasible in this field study. The incidence of hearing loss among Navy personnel was higher than anticipated in this young population being selected for work on board Navy vessels by strict medical criteria. Our results indicate that both the continuous noise exposure to moderate noise levels on board and impulse noise exposure is detrimental to hearing. Based on the findings from this and recent RNoN studies, ,, we are of the opinion that a more specified and targeted HCP should be implemented in the RNoN. Reduction of noise exposure and further awareness of the harmful effects of noise are important in order to prevent impaired hearing. We would like to thank Hjalmar Johansen, Christin Pedersen, and Eirik Veum Wilhelmsen in the RNoN for cooperation. We thank Ellen Skare, Unni Nicolaysen, Pål Pedersen, Jane Berit Berg, Hilde Kristin Pettersen, and Geir Marvin Engerstø for collecting the data, Εgot Irgens and Lorentz Irgens for helpful support with the statistics and proofreading, and Truls Gjestland, Hilde Gundersen, Camilla Hauge, Gunhild Koldal, Ole Jacob Møllerløkken, Gunnhild Oftedal, and Erlend Sunde for valuable contributions in completion of the project. The study is funded by the Royal Norwegian Navy. Engdahl B, Tambs K. Occupation and the risk of hearing impairment-results from the Nord-Trøndelag study on hearing loss. Scand J Work Environ Health 2010;36:250-7. Tak S, Calvert GM. Hearing difficulty attributable to employment by industry and occupation: An analysis of the National Health Interview Survey-United States, 1997 to 2003. J Occup Environ Med 2008;50:46-56. Lie A, Skogstad M, Johannessen HA, Tynes T, Mehlum IS, Nordby KC, et al. Occupational noise exposure and hearing: A systematic review. Int Arch Occup Environ Health 2016;89:351-72. Meyer JD, Chen Y, McDonald JC, Cherry NM. Surveillance for work-related hearing loss in the UK: OSSA and OPRA 1997-2000. Occup Med (Lond) 2002;52:75-9. Helfer TM, Canham-Chervak M, Canada S, Mitchener TA. Epidemiology of hearing impairment and noise-induced hearing injury among U.S. military personnel, 2003-2005. Am J Prev Med 2010;38(Suppl):S71-7. Bohnker BK, Page JC, Rovig G, Betts LS, Muller JG, Sack DM. U.S. Navy and marine corps hearing conservation program, 1995-1999: Mean hearing thresholds for enlisted personnel by gender and age groups. Mil Med 2002;167:132-5. Sunde E, Irgens-Hansen K, Moen BE, Gjestland T, Koefoed VF, Oftedal G, et al. Noise and exposure of personnel aboard vessels in the Royal Norwegian Navy. Ann Occup Hyg 2015;59:182-99. Mantysalo S, Vuori J. Effects of impulse noise and continuous steady state noise on hearing. Br J Ind Med 1984;41:122-32. Moen BE, Koefoed VF, Bondevik K, Haukenes I. A survey of occupational health in the Royal Norvegian Navy. Int Marit Health 2008;59:35-44. Irgens-Hansen K, Sunde E, Bråtveit M, Baste V, Oftedal G, Koefoed V, et al. Hearing loss in the Royal Norwegian Navy: A cross-sectional study. Int Arch Occup Environ Health 2015;88:641-9. Theodoroff SM, Lewis MS, Folmer RL, Henry JA, Carlson KF. Hearing impairment and tinnitus: Prevalence, risk factors, and outcomes in US service members and veterans deployed to the iraq and Afghanistan wars. Epidemiol Rev 2015;37:71-85. Henselman LW, Henderson D, Shadoan J, Subramaniam M, Saunders S, Ohlin D. Effects of noise exposure, race, and years of service on hearing in U.S. Army soldiers. Ear Hear 1995;16:382-91. Humes LE, Joellenbeck LM, Durch JS. Noise and Military Service: Implications for Hearing Loss and Tinnitus. Washington, DC: The National Academies Press; 2005. ISO 8253-1 (2010) Acoustics - Audiometric test methods - Part 1: Pure-tone air and bone conduction audiometry. Geneva: International Organization of Standardization; 2010. DoD Instruction Hearing Conservation Program 2010;6055:12. OSHA Occupational Safety and Health Standards 29 CFR 1904.10(C). ISO 7029 (2000) Acoustics - Statistical distribution of hearing thresholds as a function of age. Geneva: International Organization of Standardization; 2000. Wolgemuth KS, Luttrell WE, Kamhi AG, Wark DJ. The effectiveness of the Navy′s hearing conservation program. Mil Med 1995;160:219-22. Bohnker BK, Page JC, Rovig G, Betts LS, Sack DM. Navy Hearing Conservation Program: Threshold shifts in enlisted personnel, 1995-1999. Mil Med 2002;167:48-52. Trost RP, Shaw GB. Statistical analysis of hearing loss among Navy personnel. Mil Med 2007;172:426-30. Muhr P, Rosenhall U. The influence of military service on auditory health and the efficacy of a Hearing Conservation Program. Noise Health 2011;13:320-7. Ylikoski J. Acute acoustic trauma in finnish conscripts. Etiological factors and characteristics of hearing impairment. Scand Audiol 1989;18:161-5. Tambs K, Hoffman HJ, Borchgrevink HM, Holmen J, Engdahl B. Hearing loss induced by occupational and impulse noise: Results on threshold shifts by frequencies, age and gender from the nord-trøndelag hearing loss study. Int J Audiol 2006;45:309-17. Nondahl DM, Cruickshanks KJ, Wiley TL, Klein R, Klein BE, Tweed TS. Recreational firearm use and hearing loss. Arch Fam Med 2000;9:352-7. Heupa AB, Gonçalves CG, Coifman H. Effects of impact noise on the hearing of military personnel. Braz J Otorhinolaryngol 2011;77:747-53. Christiansson BA, Wintzell KA. An audiological survey of officers at an infantry regiment. Scand Audiol 1993;22:147-52. ISO 1999 (1990) Acoustics - Determination of occupational noise exposure and estimation of noise-induced hearing impairment. Geneva: International Organization of Standardization; 1990. Stewart M, Konkle DF, Simpson TH. The effect of recreational gunfire noise on hearing in workers exposed to occupational noise. Ear Nose Throat J 2001;80:32-34,36,38-40. Hamernik RP, Henderson D, Crossley JJ, Salvi RJ. Interaction of continuous and impulse noise: Audiometric and histological effects. J Acoust Soc Am 1974;55:117-21. Pirilä T, Jounio-Ervasti K, Sorri M. Left-right asymmetries in hearing threshold levels in three age groups of a random population. Audiology 1992;31:150-61. Cox HJ, Ford GR. Hearing loss associated with weapons noise exposure: When to investigate an asymmetrical loss. J Laryngol Otol 1995;109:291-5. Kuronen P, Sorri MJ, Pääkkönen R, Muhli A. Temporary threshold shift in military pilots measured using conventional and extended high-frequency audiometry after one flight. Int J Audiol 2003;42:29-33. Olszewski J, Mi³oñski J, Su³kowski WJ, Majak J, Olszewski S. Temporary hearing threshold shift measured by otoacoustic emissions in subjects exposed to short-term impulse noise. Int J Occup Med Environ Health 2005;18:375-9. Irgens-Hansen K, Gundersen H, Sunde E, Baste V, Harris A, Bråtveit M, et al. Noise exposure and cognitive performance: A study on personnel on board Royal Norwegian Navy vessels. Noise Health 2015;17:320-7.